Manufactured in Australia, our Rhino Glasswool Insulation range is made from lightweight,flexible and resilient glasswool, specially designed for the thermal insulation and acoustic performance of domestic and commercial buildings. Designed to make homes feel cooler in summer, warmer in winter and to provide cost savings all year round. Rhino Glasswool Insulation range is available in a range of sizes, R-values and acoustic performance ensuring there is an effective and efficient product solution to suit any application. Thanks to advances in formulation, our glasswool range is low itch – making it comfortable to handle during installation and a trade preferred insulation solution. To gain maximum comfort and energy savings for your home, installation of ceiling batts is recommended. 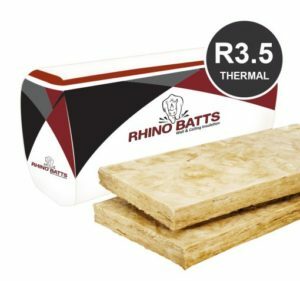 With Rhino Ceiling Batts, which come in a full range of “R values”, you can stop up to 70% of heat flowing through your home’s ceilings which is the area of greatest heat loss in the home. Need Insulation? We Provide No Obligation Free Quotes!